NC9500, another revolutionary product and cutting edge model from MA, is so far the most powerful fitness sorter in the MA portfolio, featuring expandable modular stacker design on top of enhanced and reliable authentication & fitness-sorting ability. NC9500 stops counterfeits by using the most advanced counterfeit detection technology in the industry. 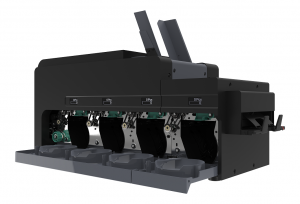 With the expandable stacker design, user is able to process banknotes in the shortest time. 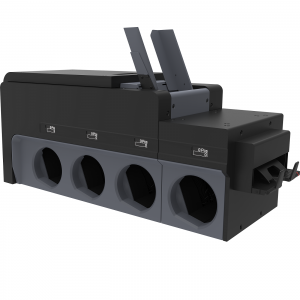 Easy modes switching to fulfill all kind of cash handling process, it reduces workload with high speed and accuracy. 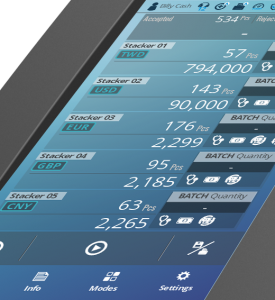 Supporting most of the currencies worldwide, and various possibilities for connectivity, satisfying the demand for large banknote handling environment. Multi Currency – Capable of recognizing multi currency based on character of each banknote. Fitness – Sorting banknote by fitness or quality with its capability to detect folded corners, holes, soil, tears and tape as unfit notes. Durable and Reliable – Designed for heavy duty usage and long lasting. Connectivity – Can be connected to printer or system through LAN; operator can print out serial numbers or all vital operating results of the processed banknotes.